Shotgun Patterning: Why Do Hunters Pattern Their Shotguns? 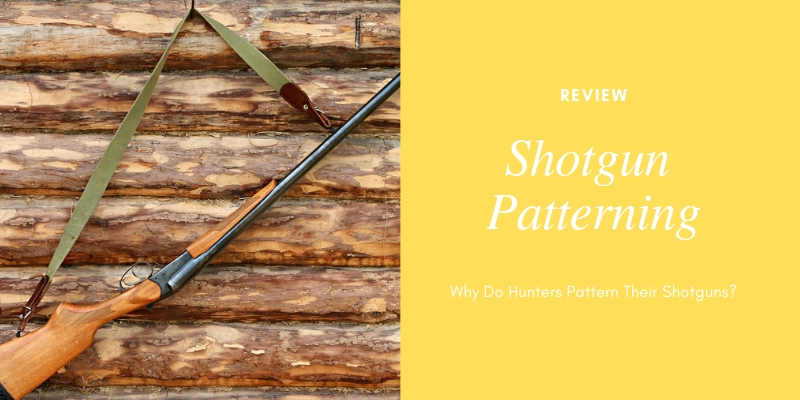 / Shotgun Patterning: Why Do Hunters Pattern Their Shotguns? Pattern-testing is extremely important because it will reveal many things about a shotgun that can prove to be invaluable in the field. Steel patterning plates work quite well with lead shot and soft nontoxic shot such as Bismuth and Tungsten-Matrix, but they should not be used when testing loads containing steel shot or other equally hard nontoxics such as Hevi-Shot and Tungsten-Iron. Pellets from these could bounce back and hit the shooter. You can make your own patterning board by attaching heavy cardboard to a couple of eight-foot, wooden 2x4s with their ends buried about 18 inches into the ground. You will also need plain paper measuring 36 to 40 inches wide. A roll can be purchased at most paper supply houses, or you might check with your local newspaper publisher to see if unused scrap paper of that width is available. Use a heavy-duty staple gun to attach a sheet of paper to the backboard, and you are ready to shoot your first pattern. The soft backboard used on a rig of this type makes it suitable for testing all types shot. I do a lot of pattern testing and find the Targomatic system from Baker Engineering (www.targomatic.com) well worth the $99 price tag. I prefer to pattern-test while sitting at a benchrest with my elbows resting atop something soft. In a pinch, a coat or duffel bag will do. It is important that the gun be held steady as its trigger is squeezed. If you find it too tiring to support the shotgun with your arms, try resting the back of the hand that holds its fore-end atop a soft support. Testing heavy shotshell loads from the bench can become uncomfortable, so don’t be bashful about placing a sausage-shaped “sissy bag” from Brownells (661/623-4000, www.brownells.com) or Sinclair International (219/493-1858, www.sinclairintl.com) between the stock and your shoulder. Shotgun and shotshell manufacturers test their products by shooting a pattern at 40 yards and then drawing a 30-inch circle around the highest concentration of holes in the paper (the .410 is tested at 25 yards). They then count the pellet holes in the circle and compare it with the number of pellets in the load to determine a shotgun’s choke or a load’s performance. Since patterns fired with the same gun/choke/load combo can vary from one to the next, the manufacturers usually fire a minimum of 10 patterns and average them for the final result. What you have just read is quite useful for those who desire to compare the performance of their shotguns and loads to the industry standards, but for those of us who take most game birds closer to the muzzles of our guns, shooting at closer ranges reveals more useful information. Since most of the bobwhite quail I bag hit the ground 15 to 25 yards from the toes of my boots, I am more interested in how a gun/load combination performs at those ranges. A shotgun used for wingshooting should place the center of its shot pattern either dead on the shooter’s hold point or slightly high. If you find that your gun is shooting too high or too low, it can be cured by changing the amount of drop at the comb of its stock. Lowering the comb with a wood rasp (or having it done by a gunsmith) will lower your eye in relation to the muzzle of the gun and cause the gun to shoot lower. Increasing comb height by the application of layers of adhesive-backed moleskin will cause it to shoot higher. Applying layers of the same material to the left side of the comb will cause the gun to shoot farther to the left (for a right-handed shooter) while removing wood from that side of the stock will cause it to shoot farther to the right. Some guns may require more drastic measures. A practical option for a pump or autoloader with no rib on its barrel is to have a gunsmith adjust pattern point of impact by carefully bending the barrel in the proper direction. A barrel with a rib can also be bent, but since a portion of the rib will likely have to be broken loose and then resoldered back in place, it can be expensive. Another option is to install an optical sight on a shotgun and then zero the gun like a rifle. This option is popular among turkey hunters, but I doubt if wingshooters will ever accept it in great numbers. The best fix for any type of gun that doesn’t shoot where you are looking is to have an eccentric screw-in choke fitted to its barrel by Briley Manufacturing (800/331-5718,www.briley.com). When this type of choke is installed, its bore and the bore of the barrel are intentionally misaligned by the precise amount needed to shift pattern point of impact by the desired amount and in the desired direction. It doesn’t affect pattern quality. Spending some time at the pattern board can also reveal a gun’s preference in loads and shot sizes. Just as deer rifles often shoot more accurately with some loads than with others, so it goes with shotguns–except in the case of scatterguns we often see differences in pattern quality. Last but certainly not least in importance, testing a shotgun will reveal how the effective diameters of the patterns it shoots are affected by changes in choke constriction, shot sizes and load quality at the various ranges at which game birds are usually taken. For example, if most of your shots are inside 25 yards and the effective pattern diameter delivered by your gun/choke/ammo combination measures smaller than 25 inches at that distance, you should seriously consider switching to a choke with less constriction. Moving to the opposite extreme, if the effective pattern diameter of your long-range load measures much greater than 40 inches at 40 yards, you might need to tighten up the choke in order to deliver adequate shot density at that range.